As a Magento Professional Solution Partner,our exceptional team members design and deploy unique eCommerce websites for your brand, including extensions and custom features. Thinking of migrating your Magento to Magento 2? Magento 2 is the evolution of Magento's platform which was originally launched in 2008. 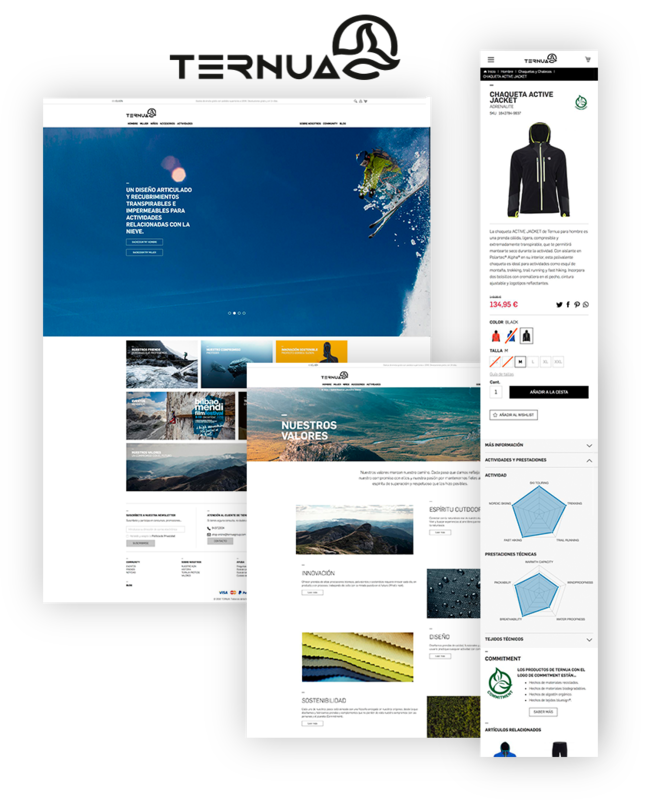 This new and improved Omnichannel Commerce Platform provides a powerful shopping experience for the consumer, an efficient tool for the merchandiser, a scalable foundation for the developer, and a flexible system for the designer. If you are still using Magento 1.0, then you can download our free Magento user guide (spanish). The new generation of eCommerce is here. Visit the web of Ternua. Magento is an open source platform, that gives you full control of your online channel. Building your online presence with Magento allows us to create a store based on your customer’s needs instead of your platform’s limititations. We are experts on developing Magento B2B / B2C platforms. We deploy and optimize your eCommerce and we integrate it with your ERP and CRM Systems in order to let you manage all your business info fast and effectively. Boost sales by creating a seamless experience for your customers across multiple devices, anywhere, anytime. With a large community of developers continuously improving the code, this Open Source platform allows to create fully personalized online stores. Magento has been built specifically for eCommerce, which is not the case with SAP or IBM who created their respective platforms (Hybris and Websphere) to complement their Business Suite. When it comes to page load speed, query processing time and other such performance parameters, Magento emerges as the winner again. Magento has no boundaries. It integrates perfectly with customised extensions and features. Which allows us to create unique customer experiences for each web store. No matter how much your needs grow, the platform will adapt and grow with them. Magento integrates with a multitude of third-party services including payment gateways, shipping services, database applications, shipment tracking, etc. Magento is a highly SEO-friendly content management system. It comes preloaded with various SEO features such as search engine, URLs, sitemaps, layered navigation, URL rewrites, meta tags, descriptions, etc. Every Magento designed site is Responsive. Magento is already integrated with Google Analytics, so you will have easy access to many reports (sales, abandoned shopping cart, search terms, coupon usage, etc.). Magento meets all the requirements for your eCommerce and has a lower Total Cost of Ownership than any other platform. The true platform for growth. Get your bespoke eCommerce, unique and scalable. Recommended for fast-growing and large businesses. This is the ultimate solution for those enterprises thinking of taking their business to new heights. Magento Enterprise Edition is easy to use, has wide flexibility, and deployment is faster than any other platform. Including IBM Websphere or Hybris. Perfectly integrated, Magento Enterprise Edition provides advanced features, scalabity, flexibility and high-perfomance solutions. The cost efficient solution for your business. Specially recommended for startups, small, and medium sized enterprises. This version is Free Open Source. Magento Community Edition enables the creation of integrated, scalable, and fully customizable eCommerce sites. Which Magento edition best suits your needs? Magento Community Edition does not offer merchants all the features that are shipped with the Enterprise Edition. We therefore recommend to evaluate your own feature requirements and compare them to the available feature set on the Magento Community Edition. But if you are serious about eCommerce or looking to take your site to the next level, then you should be considering Magento Enterprise Editon. Set promotional pricing for specific stores, categories, customer groups, or products. Create flexible coupons for specific stores, customer groups, time periods, products, and categories. Export coupon codes for offline distribution,email, newsletters, and more. Set multi-tier pricing for quantity discounts. Automatically generate a Google sitemap. Take full control of URLs with URL rewrite. Create metadata for products, categories, and content pages. Control multiple websites and stores from one Admin panel. Define roles and permissions to control access to administrative features. Use the content management system to create and easily edit pages and content blocks. Set tax rate based on location, product type, or customer group (i.e., wholesale vs. retailer). Create simple, configurable (e.g., choose size, color, etc. ), bundled, and grouped products. Include downloadable/digital products with samples. Allow customer-personalized products (e.g., upload images and text for monogramming). Easily manage inventory with support for back ordered items. Filter products in categories and search results by price range, brands, color swatches, and other attributes with layered/faceted navigation. Present product category items in grid or list format. Customize the look and feel of categories and assigned product pages. Show multiple images per product. Display product videos from YouTube or Vimeo. Include swatches to show colors, fabrics, and more. Set related products, up-sell, and cross-sell to increase average order value. Provide an option to add products to a wish list. Automatically display shipping options based on address information. Show tax and shipping estimates in the shopping cart. Offer guest and registered user checkout. Registered customers are automatically recognized when they enter their email addresses in checkout. Enable shoppers to create a customer account with one click on the checkout thank you page. Get HTTPS support for front-end and back-end. Allow customers to save their shopping carts to complete their purchases later. Qualify for the easiest level of PCI compliance (SAQ-A or SAQ A-EP), depending on payment methods used. Set flat rate shipping fees per order or item. Provide on-site order tracking from customer accounts. Create multiple invoices, shipments and credit memos per order to allow for split fulfillment. Print invoices, packing slips, and shipping labels. Allow customer service to update products and coupons in customers’ shopping carts and wish lists. Create customizable emails for account updates, password resets, and more. Choose default billing and shipping addresses. Store unlimited addresses in the address book. See order status and history. Create a sharable wish list. Manage multiple country sites all from the same store or environment. Receive support for localization, multiple currencies, and local tax rates. Use EU cookie notification to simplify EU Privacy and Electronic Communications Directive compliance. Gain insights with Google Universal Analytics. Access the following reports through the Admin dashboard. Sales report, Abandoned shopping cart, Best purchased products, Coupon usage, etc. Build on a modern tech stack that uses popular frameworks and supports industry standards. Make fine grain customizations and easily add or remove functionality with a modular code base. Integrate Magento with third-party applications using efficient web APIs with SOAP and REST support. Smoothly manage interactions between extensions using plug-ins and dependency injection software design patterns. Enable large teams of administrative users to manage orders and make scheduled product updates. Customer Segmentation, Targeted Promotions & Merchandising. Category View and Purchase Permissions per Customer Group (Limited Catalog Access). Add to Cart by SKU. Support for Alternate Media Storage – CDN and Database. Strong Data Encryption, Hashing and Key Management. We’ve created great Magento projects for our clients.